It’s true, we need reinforcements in the trenches. But if you knew the true horrors of this place, you would be just as unwilling as I am to force it upon any man. The truth is, I wouldn’t bring my worst bloody enemy over here to go through this. After the commencement of World War One in 1914, Australia immediately pledged support for Britain’s declaration of war on Germany. As service in our expeditionary force – the First Australian Imperial Force – was voluntary, enlistment offices were overwhelmed with the large queues of Australian men volunteering to join the battles in Europe and the Middle East. Victory was expected within months. After two long years, a feeling of exhaustion spread through Glebe’s streets as hundreds of families endured the terrible loss of a loved father, brother or son. 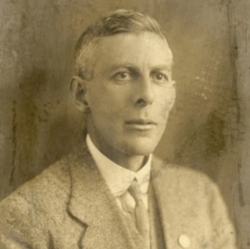 As voluntary enlistment levels fell sharply, military and political leaders, including Glebe’s mayor, Ralph Henry Willis Stone, proposed a conscription scheme for mandatory overseas military service. 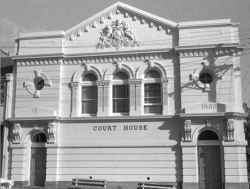 As the Labor Prime Minister, William Hughes, CH, QC, lobbied for the change via a plebiscite, Stone chaired a pro-conscription meeting at the Glebe Town Hall, alongside New South Wales Premier William Holman. There was an equally vocal opposition to conscription. William Martin, a local architect and future alderman of Glebe, told an anti-conscription rally to ‘show the world that while always willing to do their share in the defence of the Empire, they are not going to be forced to the points of German bayonets’. the sole support of aged parents, a widowed mother, orphan brothers or sisters. In Glebe, exemption claims were reviewed at the Glebe Police Court on St Johns Rd. J. Lethbridge King, the great-grandson of third governor of NSW, Lieutenant Gidley King, was one of the presiding stipendiary magistrates. Mr King said ‘helping to support parents was not a sufficient ground for granting exemption from military service.’ He refused to recognise claims if the applicant was not the sole son and other sons in the family were of military enlistment age (21-35). Albert W. Green, despite the contention that his employer, a printing firm, would be seriously understaffed. Robert Commons gave $96 per week* to his family but Captain Greaves, the military representative for the court, contended that his military pay would provide a larger contribution. William Frederick Brown stated he was the sole support for his brother, an apprentice in the iron trade. He asserted that he’s the only British person making decorations and ornaments, otherwise made solely by Germans. A postal assistant, supporting his widowed, crippled mother with $771 per month. Of his four brothers, two were enlisted and one was a widower. A clerk, the sole support for his young brother and sister. He did not know the location of his father and another brother did not contribute. A chemist, urging that he was engaged in a business of national importance. A machinist, the main support for his widowed mother. He had a 21-year-old brother. A despatch clerk, one of five sons, two currently enlisted. Even though he appeared to satisfy the clause that no more than half of the sons in a family would be obligated to serve. A group of theological students. Their college principal stated that training of men for the pulpit was of national importance. The military representative, a Captain, contended that ‘a fine field for operation lay before the young students among the enlisted men going into camp’. Based on these submissions, the magistrate granted a partial exemption for one student, stipulating that the applicant serve only in a non-combatant corps, and another temporary exemption to sit for an examination. A manager, engaged in a reorganisation for the previous five years to improve his firm’s department. The business was not of national importance but his two assistants had already enlisted. He was allowed a six-month exemption. Several naturalised Greeks, keepers of restaurants and oyster saloons, spoke of the utter impossibility of carrying on their business if they were sent to the front. They were allowed one month to settle their affairs. A 28-year-old coal foreman, who pleaded that ‘it was expedient in the national interests that his services should be retained in furthering the despatch of transports’. A telephone mechanic, the only son to care for his widowed mother. One brother is a hospital inmate. The magistrate considered that leniency should be shown. A 22-year-old student at the University of Sydney, completing last year of training. Neil McKinnon, the sole support for his mother, providing $192 per week. An applicant, the sole support for his widowed mother. His brother was confined to an asylum for the previous decade. The plebiscite vote was held on Saturday 28 October 1916. Perhaps partly due to ill-feeling from the domestic conscription directive and the reports of exemption claim refusals, the vote was narrowly defeated with 51.61% ‘No’ votes. In New South Wales and the Glebe’s federal electorates of West Sydney and Dalley, the result was more definitive, with only 42.92%, 28.31%, 35.86% ‘Yes’ votes respectively7. In 1924, a memorial designed by William Martin and honouring Glebe’s soldiers serving in World War One was installed in Dr. H. J. Foley Rest Park on Glebe Point Rd. 7. Bruzgulis, M., Letter to the Editor. The Glebe Society Inc. Bulletin. Issue 10 of 2015, p.2. Currency values are recorded in the decimal, inflation-adjusted equivalents.